Warning of an intended attack on Kambula was brought in by a native one of Uhamo’s men about 11 A.M. on 29th March 1879, dense masses of the enemy were seen in the distance, when all the force was assembled and the cattle driven into their laager, At 1.30 P.M. the action commenced by mounted troops, under Colonels Buller and Russell, engaging the enemy on the north of the camp. They were speedily forced to return into the laager, followed by the Zulus until they were within 300 yards, when a heavy fire from the 90th Regiment checked their advance, and they opened out round the camp. 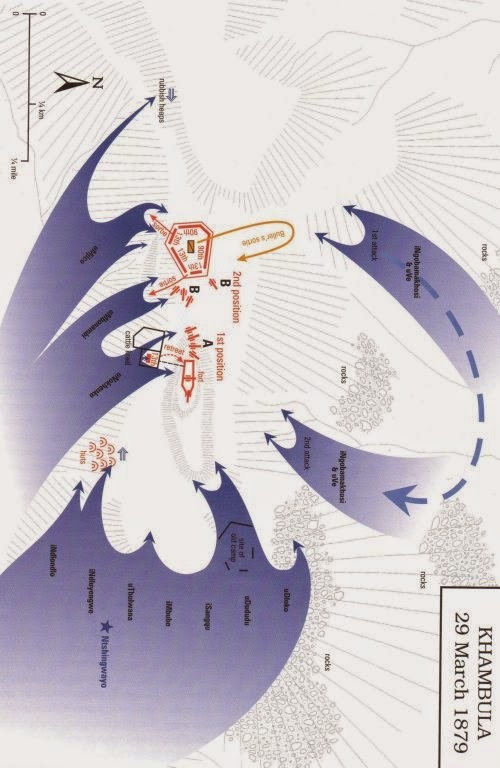 At 2.15 the right front and rear of the camp were attacked by heavy masses of the enemy, who, apparently well supplied with Martini-Henry rifles, occupied a hill commanding the laager, enfilading it so that the company of the 13th posted at the right rear of the enclosure had to be withdrawn. The front of the cattle laager was, however, stoutly held by a company of the 13th; but the Zulus coming boldly on, Major Hackett, with two companies of the 90th, was directed to clear the slope. They sallied out into the open, driving the Zulus back in a gallant manner under a heavy fire, until ordered to retire by Colonel Wood. While bringing his men in, Major Hackett was dangerously wounded. The two guns in the redoubt were admirably worked by Lieutenant Nicholson, Royal Artillery, until he was mortally wounded when Major Vaughan, Royal Artillery, replaced him. Major Tremlett, Royal Artillery, with four guns, remained in the open during the engagement. The attack began to slacken about 5.30 P.M., enabling Colonel Wood to assume the offensive the Zulus were driven from the cattle kraal into which they penetrated, and from the immediate vicinity of the camp, the infantry doing great execution among the retreating masses. The pursuit was taken up by the mounted men under Colonel Buller, and continued for seven miles, killing great numbers, the enemy being too exhausted to fire in their own defence (Colonel Wood’s despatch of March 30th). All agreed in admiring the pluck of the Zulus, who, under tremendous fire, never wavered, but came straight at us. The loss of No. 4 Column was 2 officers killed, 5 wounded, and 80 men killed and wounded. The strength of the enemy was thought to be about 20,000, of whom 1000 are supposed to have been killed. Colonel Wood’s operations at Hlobane were for the purpose of making demonstrations against the enemy, as directed by the General, who had reason to believe at that time, that he should find the whole Zulu army between his force and Eshowe.